Forrest J. "Forry" Ackerman, creator of Famous Monsters of Filmland Magazine, died Thursday. "Famous Monsters" was the horror movie aficionado's equivalent of Newsweek back when I was a lad in the 60's and early 70's. The magazine covered new movies as well as all the classics and schlock we saw on late night TV horror double features like Joplin, Missouri's Dimension 16. Amid the sometimes pandering articles were a myriad of ads for Aurora monster models and such. I remember ordering and receiving a Vampirilla model kit - quite a racy thing for a ten year-old to have. Eagerly I'd tag along with mom at Arlen's, Food Town or Thriftway to see if the magazine rack held a new issue of Famous Monsters, promising the latest rampages of Godzilla, Dracula sightings and unearthed secrets of the mummy's tomb. Oh, speaking of mummys, Forry made lots of puns - all of them bad. Publishing Famous Monsters was far from Ackerman's only accomplishment. He was quite influential in the early careers of many authors, including Ray Bradbury. He is even credited with coining the term, "sci-fi", which he said he got from seeing "hi-fi." I had the pleasure of a long phone conversation with Ackerman in the late 1980s when I was researching the origin of a lead Brachiosaurus figurine I'd found - a relic from the 1925 silent film, The Lost World. Amid a few of his trademark bad puns, he gave me his best guess background on the piece and was a fount of information on other bits of The Lost World flotsam that had survived extinction. He was quite excited to talk to another fan of classic dinosaur films and I'll never forget his insistence that I speed to his home with all due haste so we could discuss these matters in the hallowed halls of the "Ackermansion." It didn't seem to impact him that I was in Kansas and he lived in LA. It wasn't an exclusive invitation at all. When he was home and feeling well, he opened the Ackermansion - and the Acker mini-mansion after he downsized - to people wanting to see the huge collection of horror and sc-fi memorabilia housed there. In 2005, after concluding a Route 66 trip to LA, I tried to take him up on the offer but he was at a sci-fi convention in Europe. 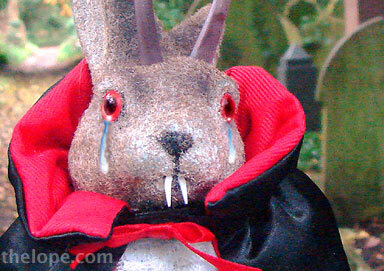 I had so wanted to photograph the vampire jackalope with a cape given Forry by Bele Lugosi. And now Forry is gone - wolfsbane to ashes, Tanna leaves to dust. ...makes me so sad that I want my mummy (bad pun in honor of you, Forry).